We know the Moon is dead and dark, but wow does this black-and-white photograph ever drive that message home. China’s Chang’e 4 lander appears as a two-pixel-wide speck in the NASA photo, providing an incredible sense of scale. Earth has its fair share of barren landscapes, but there’s something truly dreary and forbidding about the Moon. It’s just so... alien. 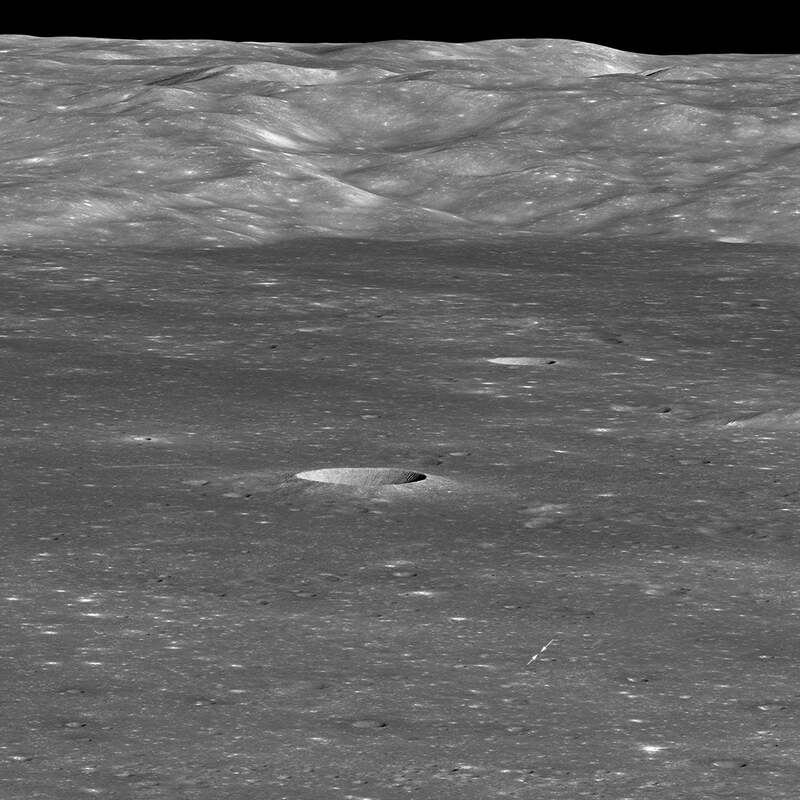 When the Chang’e 4 spacecraft made it to the Moon’s far side in early January, it landed on the floor of the Von Kármán crater, a feature named in honour of Theodore von Kármán—a pioneering scientist during the early days of the US space programme. This large impact crater formed about 3.9 billion years ago, and it measures around 186 kilometres (116 miles) in diameter. On 30 January 2019, NASA’s Lunar Reconnaissance Orbiter approached the landing site from the east, snapping the pic at a distance of 330 kilometres (205 miles) from the Chang’e 4 lander. The Chinese probe appears as a tiny white dot, and its mobile companion, the Yutu 2 rover, is so small it cannot be seen. The large, fresh-looking crater beyond the landing site measures nearly 4 kilometres across, or 12,800 feet, and it’s about 600 metres (1,970 feet) deep, according to NASA. Looking across the expanse, you can see the western wall of the Von Kármán crater—a mountain range that extends more than 3 kilometres (9,850 feet) above the floor of the crater. 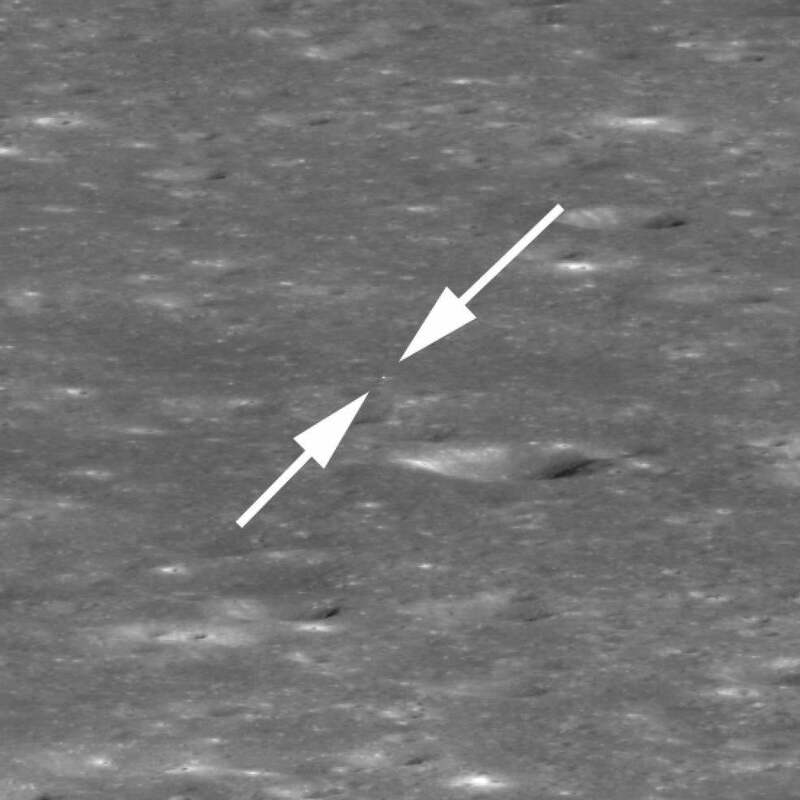 A zoomed-in photo (above) of the landing site shows the scene in more detail, including a large crater (just to the right of the arrows) near Chang’e 4 measuring around 440 metres (1,440 feet) across.